Home Mineral Researches What are the most precious stones? Diamond is a solid form of carbon with a diamond cubic crystal structure. At room temperature and pressure it is metastable and graphite is the stable form, but diamond almost never converts to graphite. Diamond is renowned for its superlative physical qualities, most of which originate from the strong covalent bonding between its atoms. In particular, it has the highest hardness and thermal conductivity of any bulk material. Those properties determine the major industrial applications of diamond in cutting and polishing tools and the scientific applications in diamond knives and diamond anvil cells. Because of its extremely rigid lattice, diamond can be contaminated by very few types of impurities, such as boron and nitrogen. Small amounts of defects or impurities (about one per million of lattice atoms) color diamond blue (boron), yellow (nitrogen), brown (lattice defects), green (radiation exposure), purple, pink, orange or red. Diamond also has relatively high optical dispersion (ability to disperse light of different colors). Locality: Kimberly, republic of South Africa. India. Brazil. Ural Mountains, Russia. Murfreesboro, Arkansas, USA. 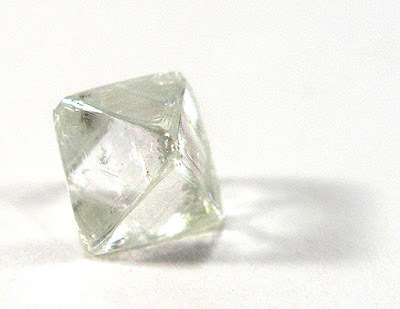 In mineralogy, diamond is a metastable allotrope of carbon, where the carbon atoms are arranged in a variation of the face-centered cubic crystal structure called a diamond lattice. Emerald is a gemstone and a variety of the mineral beryl (Be3Al2(SiO3)6) colored green by trace amounts of chromium and sometimes vanadium. Beryl has a hardness of 7.5–8 on the Mohs scale. Most emeralds are highly included, so their toughness (resistance to breakage) is classified as generally poor. The word “Emerald” is derived (via Old French: Esmeraude and Middle English: Emeraude), from Vulgar Latin: Esmaralda/Esmaraldus, a variant of Latin Smaragdus, which originated in Greek: σμάραγδος (smaragdos; “green gem”). Sapphire gemstones, up to 2.59 carats, from Kimmirut. Photo courtesy of True North Gems Inc.
Sapphire is a precious gemstone, a variety of the mineral corundum, consisting of aluminium oxide (α-Al2O3) with trace amounts of elements such as iron, titanium, chromium, copper, or magnesium. It is typically blue, but natural “fancy” sapphires also occur in yellow, purple, orange, and green colors; “parti sapphires” show two or more colors. The only color that sapphire cannot be is red – as red colored corundum is called ruby, another corundum variety. Pink colored corundum may be either classified as ruby or sapphire depending on locale. Commonly, natural sapphires are cut and polished into gemstones and worn in jewelry. They also may be created synthetically in laboratories for industrial or decorative purposes in large crystal boules. Because of the remarkable hardness of sapphires – 9 on the Mohs scale (the third hardest mineral, after diamond at 10 and moissanite at 9.5) – sapphires are also used in some non-ornamental applications, such as infrared optical components, high-durability windows, wristwatch crystals and movement bearings, and very thin electronic wafers, which are used as the insulating substrates of very special-purpose solid-state electronics (especially integrated circuits and GaN-based LEDs). Corundum ruby, 17.30 g, crystal in calcite, from Kyauksaung, Myanmar. Gift of William F. Larson. The quality of a ruby is determined by its color, cut, and clarity, which, along with carat weight, affect its value. The brightest and most valuable shade of red called blood-red or pigeon blood, commands a large premium over other rubies of similar quality. After color follows clarity: similar to diamonds, a clear stone will command a premium, but a ruby without any needle-like rutile inclusions may indicate that the stone has been treated. Ruby is the traditional birthstone for July and is usually more pink than garnet, although some rhodolite garnets have a similar pinkish hue to most rubies. The world’s most valuable ruby is the Sunrise Ruby. Taaffeite is a mineral, named after its discoverer Richard Taaffe (1898–1967) who found the first sample, a cut and polished gem, in October 1945 in a jeweler’s shop in Dublin, Ireland. As such, it is the only gemstone to have been initially identified from a faceted stone. Most pieces of the gem, prior to Taaffe, had been misidentified as spinel. For many years afterwards, it was known only in a few samples, and it is still one of the rarest gemstone minerals in the world. Recommended For You What is a Hydrothermal Vent? Since 2002, the International Mineralogical Association-approved name for taaffeite as a mineral is magnesiotaaffeite-2N’2S. Taaffe bought a number of precious stones from a jeweller in October 1945. Upon noticing inconsistencies between the taaffeite and spinels, Taaffe sent some examples to B. W. Anderson of the Laboratory of the London Chamber of Commerce for identification on 1 November 1945. When Anderson replied on 5 November 1945, he told Taaffe that they were unsure of whether it was a spinel or something new; he also offered to write it up in Gemologist. In 1951, chemical and X-ray analysis confirmed the principal constituents of taaffeite as beryllium, magnesium and aluminium, making taaffeite the first mineral to contain both beryllium and magnesium as essential components. The confusion between spinel and taaffeite is understandable as certain structural features are identical in both. Anderson et al., classified taaffeite as an intermediate mineral between spinel and chrysoberyl. Unlike spinel, taaffeite displays the property of double refraction that allows distinction between these two minerals. Because of its rarity, taaffeite is used only as a gemstone. Poudretteite is an extremely rare mineral and gemstone that was first discovered as minute crystals in Mont St. Hilaire, Quebec, Canada, during the 1960s. The mineral was named for the Poudrette family because they operated a quarry in the Mont St. Hilaire area where poudretteite was originally found. Locality: From Mont Saint-Hilaire, Quebec, Canada. Name Origin: Named for the Poudrette family, operators of the quarry where type material was discovered. This 0.86 ct gray musgravite displays an unusual iridescent phenomenon that is clearly visible in the table facet. Photo by Kevin Schumacher. , is a rare oxide mineral. It is used as a gemstone. Its type locality is the Ernabella Mission, Musgrave Ranges, South Australia for which it was named. It is a member of the taaffeite family of minerals. Its hardness is 8 to 8.5 on the Mohs scale. The alexandrite variety displays a color change (alexandrite effect) dependent upon the nature of ambient lighting. Alexandrite effect is the phenomenon of an observed color change from greenish to reddish with a change in source illumination. Alexandrite results from small scale replacement of aluminium by chromium ions in the crystal structure, which causes intense absorption of light over a narrow range of wavelengths in the yellow region (580 nm) of the visible light spectrum. Because human vision is more sensitive to light in the green spectrum and the red spectrum, alexandrite appears greenish in daylight where a full spectrum of visible light is present and reddish in incandescent light which emits less green and blue spectrum. This color change is independent of any change of hue with viewing direction through the crystal that would arise from pleochroism. Alexandrite from the Ural Mountains in Russia can be green by daylight and red by incandescent light. Other varieties of alexandrite may be yellowish or pink in daylight and a columbine or raspberry red by incandescent light. Stones that show a dramatic color change and strong colors (e.g. red-to-green) are rare and sought-after, but stones that show less distinct colors (e.g. yellowish green changing to brownish yellow) may also be considered alexandrite by gem labs such as the Gemological Institute of America. According to a popular but controversial story, alexandrite was discovered by the Finnish mineralogist Nils Gustaf Nordenskiöld (1792–1866), and named alexandrite in honor of the future Tsar Alexander II of Russia. Nordenskiöld’s initial discovery occurred as a result of an examination of a newly found mineral sample he had received from Perovskii, which he identified as emerald at first. The first emerald mine had been opened in 1831. Alexandrite 5 carats (1,000 mg) and larger were traditionally thought to be found only in the Ural Mountains, but have since been found in larger sizes in Brazil. Other deposits are located in India (Andhra Pradesh), Madagascar, Tanzania and Sri Lanka. Alexandrite in sizes over three carats are very rare. Grandidierite is an extremely rare mineral and gem that was first discovered in 1902 in southern Madagascar. The mineral was named in honor of French explorer Alfred Grandidier (1836–1912) who studied the natural history of Madagascar.